The notion of mysterious parallel universes inhabited by magical creatures is a well-loved tradition of fairy tales and fantasy. Tapping into this enduring fascination, Lego Elves is a magical dimension accessed via a mysterious portal in Emily Jone’s grandmother’s garden (a bit like going through a wardrobe to Narnia, no?). Once Emily has been transported to the land of Elvendale, her dilemma begins: how can she get back? Thank goodness for a benevolent and intrepid group of Elvish friends with special powers who help Emily locate the four keys that will reopen the portal and allow her to return home. That’s the premise, and Naida’s magnificent Epic Adventure Ship is primed and ready to play its part in thrilling escapades. Design-wise, there are lots of great details here to excite, with the ship’s intricate curved edges, criss-cross windows, ornate golden arches and gem-encrusted trimmings. It also features a galley kitchen complete with hob and pan, a removeable sun deck, clamshell water chairs, a chill-out area and a diving board. Aficionados will notice that the characters are not the traditional mini figures, but what Lego terms ‘mini dolls’ with finer features and pert little noses and pointy chins. They are not compatible with traditional mini figures either (we know this as our tested tried to fit Naida’s head on Spiderman, but the mini dolls have thinner necks; however, Spiderman can wear the elves’ hairpieces complete with Elf ears, which might come in handy should he ever require a sneaky disguise!). Naida and Aira have individual features, as well as swirly ‘festival’ make-up. We especially like their dip-dye hair-dos with graduated colour – blue for Naida and lilac for Aira – that gets darker at the ends. Tres a la mode! 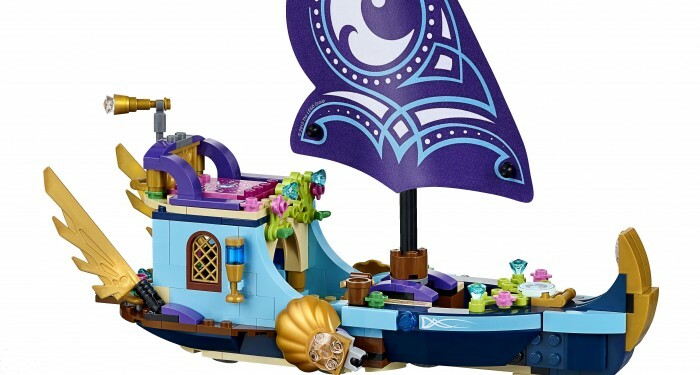 There is often lively debate about whether Lego sets should be marketed as sets for boys (Star Wars, Marvel, DC Comics) and sets for girls (Disney Princesses and Lego Friends). We’re fans of Lego, full stop, and believe that Lego appeals to boys and girls in equal measure, so we reckon the boys should give Lego Elves a chance too: after all, there are shades of The Hobbit, The Lord of the Rings and even a hint of Harry Potter in their magical elfine adventures, plus some pretty nifty features in its construction. Who is Naida? Ms Riverheart the water elf is an adventurer at heart, who is not afraid to follow her dreams and loves to sail the Izdur Ocean. Her special power is that she can controls water, like the sea, lakes and waterfalls, and has a special connection to all water animals. Who is Aira? The happy-go-lucky Ms Windwhistler is a charismatic problem-solving wind elf, though her tendency to tell the blunt truth is not always helpful. Her special power is to control air and wind, and has a special connection with flying creatures. Good For… Fine motor skills and dexterity; hand/eye coordination, and manipulation; vocabulary; storytelling and imaginative play; following instructions; problem-solving and patience. Keep in Mind… Although this is a ‘ship’, it doesn’t actually float so it’s not suitable for water play. 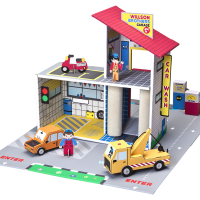 It is also part of an elaborate and extensive build-and-play world that can be added to (parents be warned!). To solve Emily’s quest to return to her home, the four magic keys from the elements of earth, wind, fire and air. 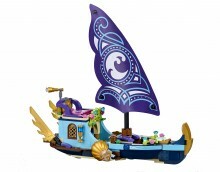 Smaller and medium size sets like Naida’s Epic Adventure Ship only contain one key, while the biggest set Skyra’s Mysterious Sky Castle contains all four. One for the Christmas list perhaps? 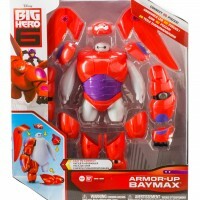 What Kids Love This will definitely appeal to kids who like imaginative play on a dinky scale. 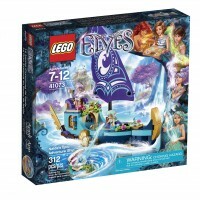 The Lego Elves website is also filled with lots of games and activities, as well as character profiles, that will enhance your child’s adventure, including a short animation using each play set that demonstrates how different features of the set could be used in pretend play – with just a few special effects added her and there. What Parents Love It’s Lego – even if the tweaks that pander to girls’ sensibilities, like mini dolls, may have less appeal to the traditionalists. Fun fact We love Lego for its versatility that sparks creativity. If you take six eight-stud Lego bricks (2×4) they can be configured in an amazing 915,103,765 combinations. Did you know? 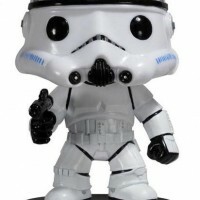 The first mini figure was produced in 1978. Since then more than 4 billion have been made – making it the world’s largest population group.